A Pennsylvania shopkeeper is in the hospital with a bullet lodged in his neck after an illegal alien used the shopkeeper’s gun against him Saturday, police said. 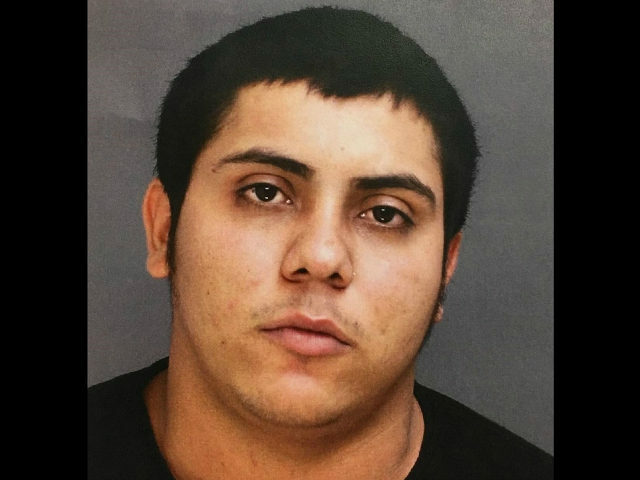 The Upper Darby Police Department told WTXF that officers arrested Pablo Quintanilla, 24, a Honduran national in the U.S. illegally, on Monday and charged him with attempted murder. The shooting took place around 9 p.m. Saturday at Aaron’s Beer Distributor, a store in the suburbs of Philadelphia. Police say the Honduran national went to the store, stole three beers, and then returned to the store when the shopkeeper punched him. Surveillance video showed Quintanilla allegedly knocking the store owner down. Upper Darby Police Superintendent Michael Chitwood said the store owner’s legally acquired handgun fell to the ground, and Quintanilla picked it up and fired four shots at his victim. Officials released Quintanilla’s picture from surveillance video to the public and were able to track him down before arresting him on Monday. Quintanilla is currently being held in the Delaware County prison, and authorities have notified federal immigration officials about his arrest. Chitwood said federal border patrol agents deported the Honduran national once before in March 2015. The shopkeeper’s son, who declined to be identified, said his father is in stable condition at a local hospital with a bullet lodged in his neck. “Every day you hope family comes home to you safely, and unfortunately on Saturday that was not the case, but he’s recovering,” the shopkeeper’s son said.